The debt capital market league table for full-year 2018 by Thomson Reuters showed a significant decline in total debt origination volume globally over the last quarter. This was largely expected, given strong macroeconomic headwinds from the ongoing U.S. – China trade war and the uncertainty surrounding Brexit for the seasonally slow period. Also, U.S. companies have been wary of raising fresh debt capital over recent quarters in view of the Fed’s hawkish rate hike process. Taken together, this resulted in the largest U.S. banks seeing a sharper decline in total debt origination deal volume compared to the industry. The five largest U.S. banks helped companies around the world raise just over $271 billion in new debt for the period – their weakest performance since Q3 2011, when the European debt crisis was at its peak. This compares to a combined deal volume of around $440 billion for these banks over the previous twelve quarters. 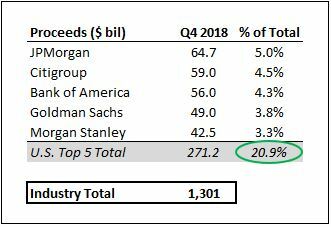 In fact, the combined market share of these banks was less than 21% in Q4 2018 – making it the worst period in this regard since at least 2009. Although JPMorgan managed to retain the top spot globally in terms of total deal volume, the diversified banking giant is expected to report a 50% reduction in associated fees for Q4 compared to Q3. JPMorgan and Citigroup have fought hard over recent years to capture the top spot in the fiercely competitive industry. While JPMorgan remains the undisputed leader in the U.S. and has an extremely strong presence in Europe, it has had less success making inroads into the high-growth Asia-Pacific region, where Citigroup has had much more success. The chart below captures the total size of debt capital market deals completed by the five largest U.S. investment banks since Q4 2017. The green-to-red shading for figures along a row show the variations in deal size for a particular bank over this period. Debt origination volumes for individual banks were taken from Thomson Reuters’ investment banking league tables for the last five quarters. The table below captures the respective market shares for each of these banks over this period. The green-to-yellow shading for figures in a quarter should help compare the relative standings of these 5 banking giants in a particular quarter. It should be noted that the largest debt capital market deals employ more than one investment bank, and the market share figures here factor in the proportion of the total proceeds generated by a particular bank. Thomson Reuters estimates the combined debt origination fees for these five U.S. investment banks to be barely $1 billion for Q4 2018 – a sequential reduction of 35% from the $1.58-billion figure for the previous quarter, and a larger fall of 39% from the $1.69-billion figure a year ago. Notably, the Fed’s rate hike process has weighed on U.S. debt origination volumes over recent quarters, which – coupled with the increasing volume of deals in emerging nations, especially in Asia Pacific – has led to the wallet share of the five largest banks shrinking from nearly 19% in Q1 2018 to less than 11% by Q4 2018. JPMorgan is expected to report the largest reduction in these fees, with the imputed fee figure shrinking by nearly 50%. The decline is primarily due to a sharp reduction in the number of debt capital deals JPMorgan participated in from 358 in Q3 2018 to 281 in Q4 2018. While fees for Citigroup and Bank of America are expected to slide 33% sequentially, the decline for Morgan Stanley and Goldman Sachs is expected to be 29% and 27%, respectively.